Hello everyone, CEO Olivia here. We are finally seeing the earth again here at Knotty Toys for Good Dogs. Spring is beginning & that means it’s time to share a few reminders of what comes with the warm weather. 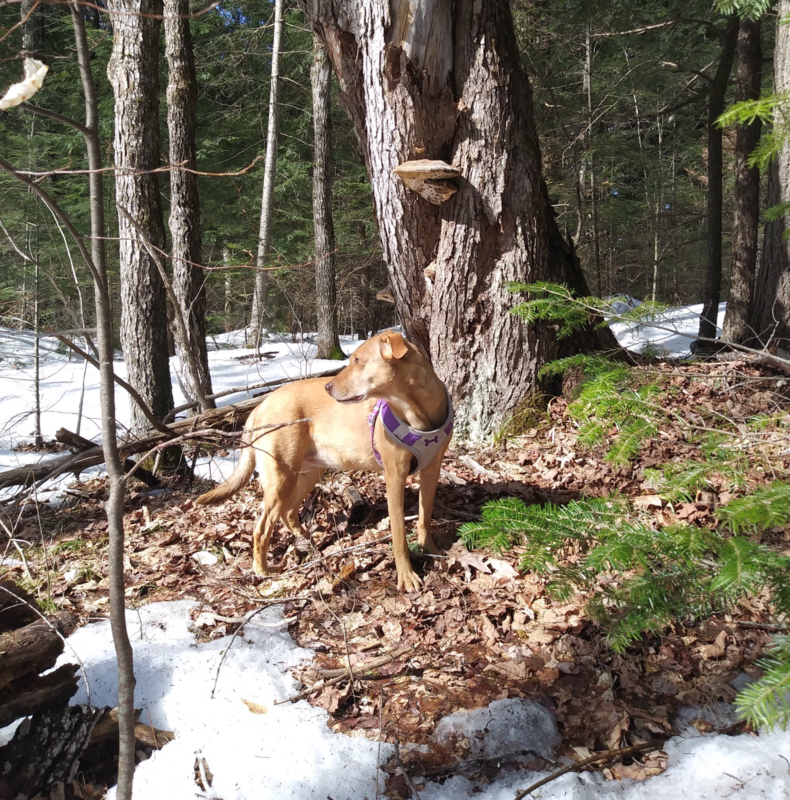 Has your good dog been active over the winter, or was lounging by the wood stove more their thing? If it’s the latter, it will take a few days to get back into summer shape. So you might want to take play time a little easy at first. You’re walks & play time can get longer over time. Once your out on the trails, you might discover things that have been buried in the snow that aren’t ideal to touch or eat. Garbage, rotting twigs or food wrappers should all be avoided. Puddles of melted snow should not be drank because they might have toxins like road salt, antifreeze or even parasites. Also, stay away from ponds or rivers. The ice may look solid but why chance it? The melt off can also cause flooding & fast moving waters. Flowers will be blooming. Good dogs can get allergies from pollen just like you. A vet recommended, over the counter antihistamine or a natural antihistamine can bring relief if needed. Speaking of flowers, lilies, azaleas, sago palms & rhododendrons are toxic to good dogs. You might want to research what you’re planting to avoid growing something dangerous to your good dog. Unfortunately Spring brings fleas & ticks. You should consult your vet about taking a flea & tick preventative. Even if you’re in a city, always check your good dog for ticks after a romp outside. If you find a tick it will be easier to remove if it hasn’t burrowed in yet. A plastic tick remover can remove a them, head & all. You can get one at a pet supply store or your vet. Where I live there is a risk of Lyme Disease. You can check online if you live in a high risk area. If you do & find a tick, put it in a jar or pill bottle with alcohol & get it to your vet where they can test it. Also, if you’re not sure if you got the head out, you should see the vet to be sure because if left in the wound it might become infected. Never squeeze a tick, it will vomit into the wound & that’s not good either. Finally, if you live rural like me, there are lots of critters waking up from the long winter. Skunks, ground hogs, porcupines or raccoons don’t make for good play dates. Always supervise your good dog & keep it on leash unless you’re at the dog park. It’s been raining here & that melts away the snow, which reminds me, there are freshly uncovered stinks that need my analysis. Enjoy the warming days. Is Your Good Dog A South Paw? Hello one & all, CEO Olivia here. My huMom recently noticed that I’m what people call a south paw. That means if I was a human, I would be predominantly left handed. When cleaning my paws she noted that my left paw often had treat bits between the toes. So she watched me & saw that if I’m holding a toy down, it’s always with my left paw. This indicates the right side of my brain is dominate over the left side. Studies have shown that being right-pawed was associated with lower arousal & calmer responses to novel stimuli & strangers. However, the dogs who chose to use their left paw seemed to be more prone to stress & have more difficulty adjusting to new or unfamiliar surroundings. It appears that a left-motor bias may be linked to a more negative affective state & a more reactive coping style. Personally, I am very reactive to strange dogs & humans. To test the paw preference of your good dog you can do what’s called the Kong test. Stuff some treats in the Kong & observe. In order to get to the treat, your good dog must immobilize the Kong which would otherwise roll around. To do this good dogs usually place a paw on the toy. The paw that the dog chooses to use is an indication of the dog’s paw preference. Do this several times to see if the paw switches. Some dogs will show no preference. Left handed humans are noted to be gifted musically. 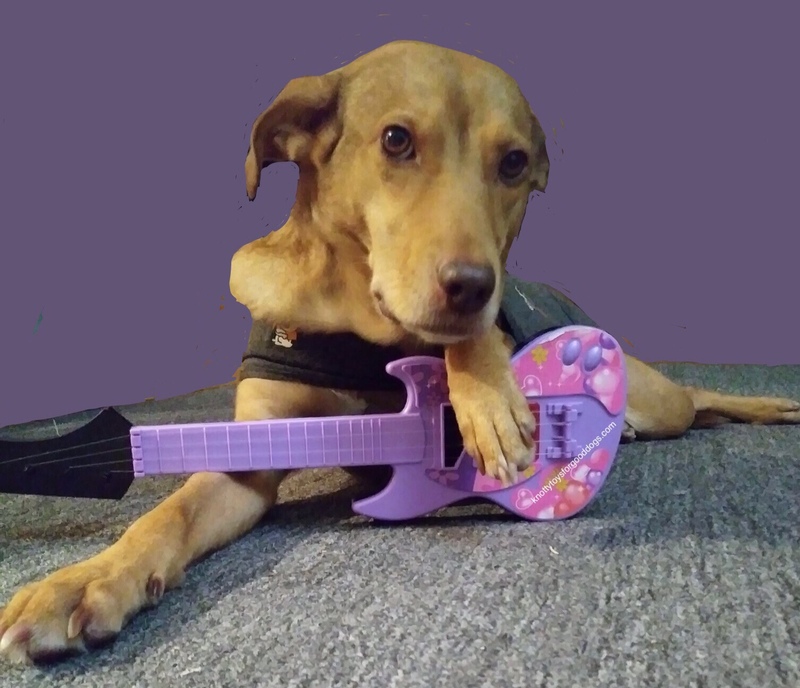 I’ve been known to bark out a tune now & then, so I think this applies to us good dogs as well. BOL! Is your good dog a south paw? Take the Kong test & see. Hello everyone, CEO Olivia here. Today is April fools day but I’m not fooling about, it’s also International Bull Terrier Day. 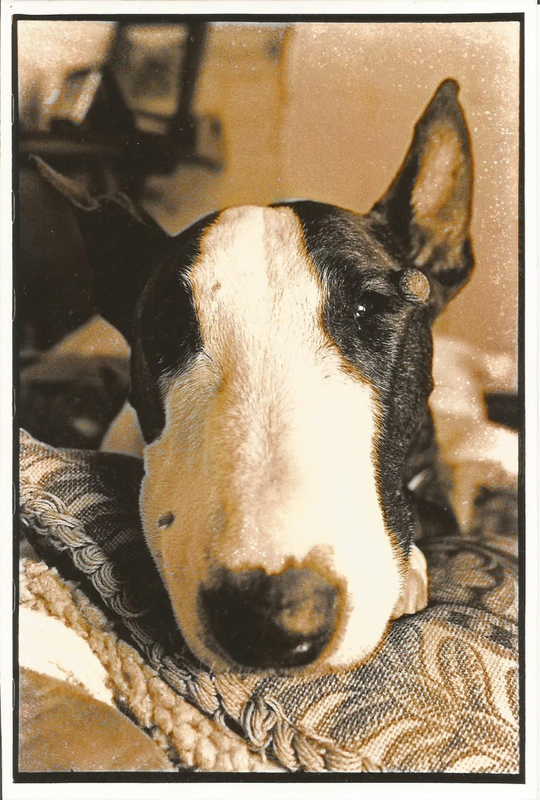 The Knotty Toys for Good Dogs logo is my HuMom’s Chelsey, who was a beautiful white & brindle bull terrier. Back in the 1860’s the first Bull Terriers appeared in England. It is believed they are a cross between the Bulldog, the English White Terrier & the Dalmatian. 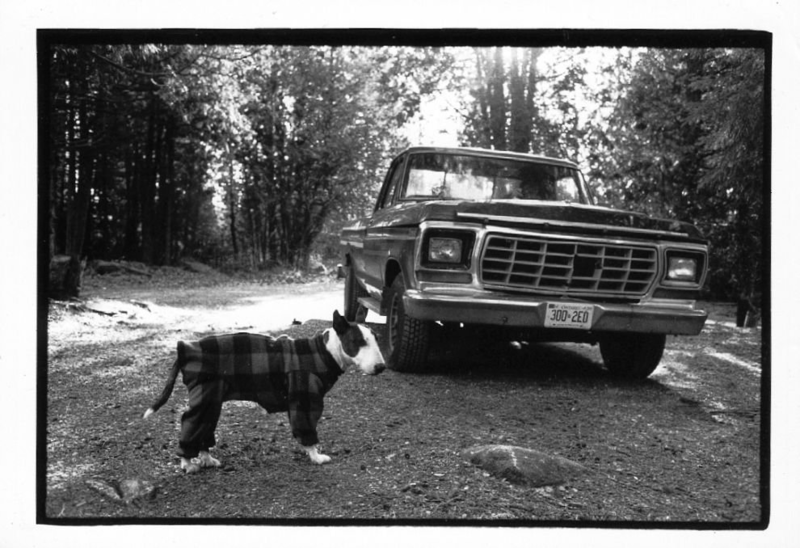 Today, the Bull Terrier is a much loved family companion. They are known to be extremely affectionate with people, & are noted for a fondness towards young children. HuMom adds that they also have a wonderful sense of humor. So happy International Bull Terrier Day to all the beautiful “mallet heads” out there.